After a couple more weeks of AT&T deliberately dropping my calls (apologies to all my friends who were on the other end at the time! ), I finally said "No mas!" and went online in search of a new provider. T-Mobile was the top contender--good J. D. Power ratings, a wide selection of affordable plans and a plethora of cool free cell phones to choose from. My only issue was the whole text messaging thing. I hate TM and I don't want to send or pay to receive them. Unlike Verizon or AT&T (I'm not sure about Sprint), T-Mobile doesn't have the option of disabling the feature. But with a little research on the Internet, I found a way around it--thanks to Jonas at TechNudge Live. Apparently you can block ALL text messages via a spam filter where, instead of specifying key words that are "spam," you create a filter character string that MUST be in the subject line. With this little trick up my sleeve, I felt confident about moving forward with a T-Mobile plan. 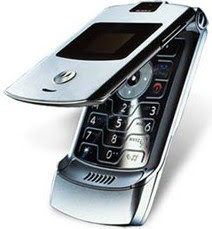 I decided on the Motorola RAZR phone. It's slick and sleek and looks like something out a Bond movie. It was also FREE! Gotta love that. In fact, I got the phone for free, plus up to $70 in rebates via an offer on Wirefly. It was pretty easy to compare phones and plans online--my only glitch was right before I went to place my order, I could not find where I needed to note that I was porting my old number from another carrier. He takes down all the info I've already input online and then proceeds to attempt to sell me insurance for the phone. No thanks. Accessories--a car charging kit? Nope. A pouch to protect it from scratches? No. Then he reads me the terms of service which I must agree to. Online I would just breeze right past that and "X" the little box, but with Robbie I have to listen to the whole thing and insert my assent at the end of each paragraph. Then he puts me on hold while he makes sure my credit info is good. Comes back and tries to sell me the insurance again. Aggravated I say, "This is why I wanted to place my order online." Confused he asks, "Why?" "Because I wouldn't have waste time listening to sales pitches!" A bit hurt he counters that he was only trying to make sure I knew about all these great offers. I'm NOT interested! I tell him. Turn OFF the phone immediately if you have any reason to suspect that interference is taking place." I'm glad I don't have a pacemaker! Now I just have to wait for T-Mobile to activate my phone so I can cancel my service with the NEW AT&T (See ya! Wouldn't want to be ya!). And then hopefully I'll be able to have complete conversations (preferably after 7 pm or on weekends, guys...) with my friends.